We think you'll agree that there's something truly special about the Stuffed Rainbow Stingray 33 Inch Plush Animal by Fiesta. This rainbow stingray stuffed animal has all of the makings of your average stingray: scales, rows of pearly white teeth, loves to swim...but it has a serious upgrade. It's rainbow. That's right! A rainbow stingray! How could you possibly go wrong with a rainbow stingray plush toy? You can't! Measuring at twenty-three inches in length, this rainbow stingray stuffed animal swims the reefs with the big fish. Stingray stuffed animals are hard to come by, but rainbow ones are even rarer. Want to impress your friends with something they've never seen before? They won't be able to take that eyes or hands off of the Stuffed Rainbow Stingray 33 Inch Plush Animal by Fiesta. Just you wait and see. They'll be asking to get a rainbow stingray plush toy of their very own before long. So what are you waiting for? Order one of your very own today! For over 40 years, Fiesta Toy has been one of the world leaders and innovators in stuffed animals and plush toys. Their wide assortment of traditional and unique stuffed animals inspires creativity and encourages imaginative play. 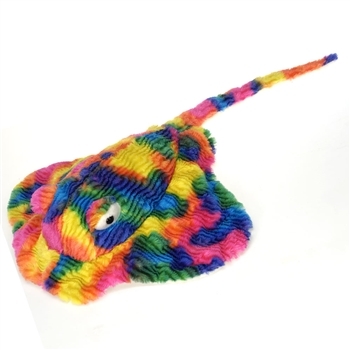 Fantastic products like this rainbow stingray stuffed animal allow children to share in the magic of the animal kingdom and learn more about the fascinating creatures that inhabit and share our planet. The Stuffed Rainbow Stingray 33 Inch Plush Animal by Fiesta is made with all new, child safe materials and meets or exceeds all U.S. safety standards. Recommended for ages three and up, we suggest surface washing for this rainbow stingray plush toy.